Members of the Delaware Harley Riders purchased Christmas gifts for six families identified by Family Promise of Delaware County. The gifts were delivered to the families last Saturday at the Family Promise office. 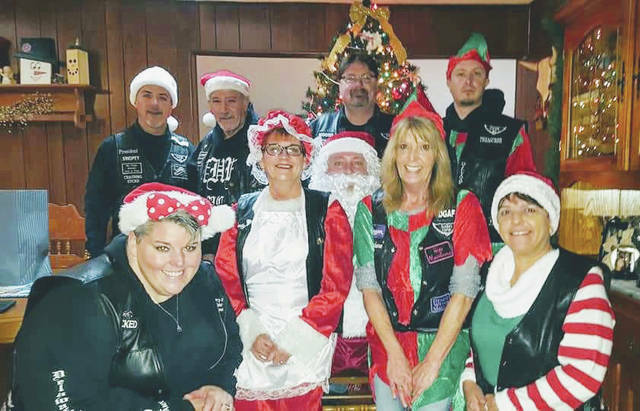 Club members in this photo include president Gary Swope, vice president Terry Wherle, treasurer Austin Tackett, road captain Scott Shaw, Tim Steck (Santa Claus), and auxiliary members Rhoda Swope, Susan Tackett, Colleen Shaw, and Sharon Hanson (Mrs. Claus). 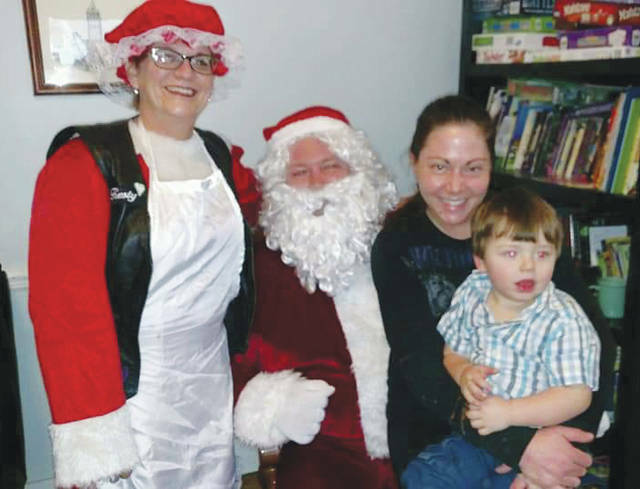 Santa Claus and Mrs. Claus — Delaware Harley Riders members Tim Steck and Sharon Hanson, respectively — share a smile with a mom and her child after delivering Christmas gifts to the Family Promise of Delaware County office last Saturday. It’s always nice to end the year on a positive note. Many individuals and groups around Delaware County did their best again this year to make Christmas a little bit brighter and happier for children and families, providing food, clothing, toys, and other items for their neighbors in need. The Delaware Harley Riders was just one of the groups that extended a helping hand during this holiday season. Auxiliary member Susan Tackett said the group, which has been active for nearly 30 years, enjoys being involved in serving the community. Proceeds from the club’s Fallen Brothers poker run are used to buy Christmas gifts each year. The club members enjoyed giving as much as the families they helped enjoyed receiving, Tackett said. Tackett said the club, now under the leadership of new president Gary Swope, is more committed than ever to doing charity work in Delaware County. The Delaware Harley Riders can be reached via email at dhrcomc@gmail.com. The Delaware Harley Riders also maintain a Facebook page.